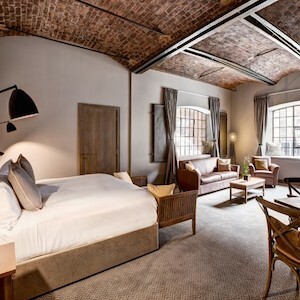 Know first that the Titanic Hotel is firmly, safely situated on land, in a restored 19th-century warehouse on Liverpool’s revitalized Stanley Dock waterfront development. Thus the only you’ll need to look out for — and here we pause to collect our prize for being the millionth teller of this old joke — is what’s floating in your glass in the hotel’s own Rum Bar. 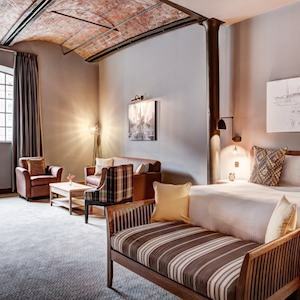 The second thing to know is that while there was talk of the Titanic being a themed hotel, a sort of dry-land homage to the ill-fated ocean liner’s air of tragic opulence, cooler hospitality heads prevailed. 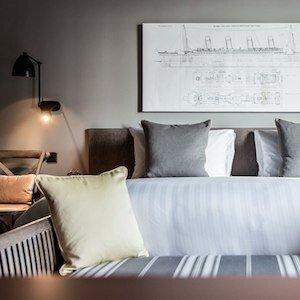 References to the historic ship are scattered throughout, but the atmosphere is not only decidedly contemporary, but somewhat restrained as well — presumably late Edwardian pomp is not the vibe the Liverpudlians are crying out for. By appearances, what they are crying out for — and what they’re getting here — are big, bright rooms and suites, luxe beds and baths, an expert reconciliation of period architecture, classic furniture and contemporary design, and a food and beverage program, if we may use so vulgar a phrase, that’s as attuned to the visual pleasures as it is to the gustatory ones. Stanley’s Bar & Grill serves modern British fare in a dramatic, oversized open-kitchen space, and the waterfront terrace is one of the more idyllic venues in town.